Y'all...I am so excited to share this recipe with you! This was a recipe that I concocted on a whim and was very pleasantly surprised. We were having my mother-in-law over for supper to eat on some leftover soup and I wanted a sweet treat to finish the meal off with. Yeah, were classy like that...we have guests over to eat leftovers...To be fair, in our household, leftovers are treated as gourmet meals since food nearly always taste better on the second day. Either way, I decided to make a little something so we weren't just serving sloppy seconds...I wanted to use items I had on hand so I did not have to run to the store again. I was absolutely blown away by how tasty this treat came out and how easy it was to prep. It is not as much fuss as apple pie and is not nearly as heavy feeling. 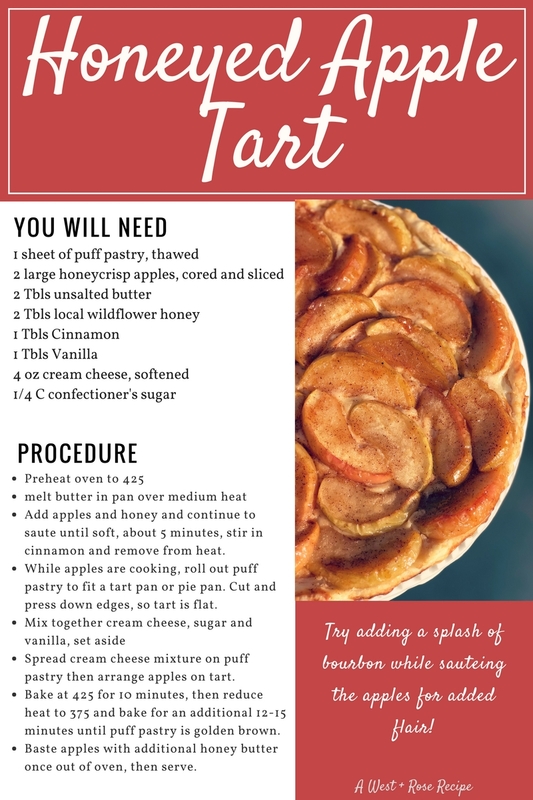 This tart has less sugar and dough than traditional apple pie, but is still impressive to guests. I also love that it can be eaten like a slice of pizza and goes great with a bold cup of coffee in the mornings! I am super proud of this recipe. It is easy, delicious...yet still comes off fancy and impressive. While I cannot claim that it is healthy, it is lighter than many fall desserts I have seen lately. I hope y'all love it as much as we do! This tart is incredible, incredible!